The old lathering hair rinse has a bit of a branding problem. “Do you have to let the shampoo soak in?” I asked Wes Sharpton, the hairdresser inaugurating my locks with Purely Perfect. “Cleanser,” he corrected, while massaging the cream into my head, currently cocked back into a salon sink. Some people use it as a mask; others just apply and rinse, he added. The product, concocted by Michael Gordon, the creator of Bumble and Bumble, functions as a shampoo and conditioner replacement–an all-in-one cleansing and nourishing treatment. What separates it from the hair care items flanking drug store aisles is that it doesn’t contain “surfactants”–the detergents that give shampoo its foaming qualities. It also doesn’t have sulfates or parabens, two chemicals that have mild associations with cancer. Instead, it’s made of aloe vera, various oils, and sulfate replacements. As such, it doesn’t lather into a sudsy consistency, like shampoo, working and feeling more like moisturizing lotion. Purely Perfect is just the latest product to take on Big Shampoo. With his creation, Gordon hopes to change the American shower regimen and kill shampoo along the way. “I honestly think in five years people are going to go, ‘Oh God, remember when we used to wash our hair with shampoo?&apos;” he told Wired in an interview this summer. In Gordon’s future we will all be using Purely Perfect and similar non-foaming “cleansers” instead. Considering the dominance (or tyranny) of shampoo in its current form, Gordon’s vision is ambitious. But he’s not alone in the cause. Purely Perfect is just the latest product to take on Big Shampoo. It joins No-Poo, Wen, the rise of “sulfate-free,” and a committed DIY, natural shampoo community. As the creator of Purely Perfect has noted, the main property of shampoo is its foam, or the presence of detergent, the generic term for the surfactants or sulfates. Cleansers minimize or, in the case of Purely Perfect, completely eradicate that ingredient, turning shampoo into more of a cream or lotion. Shampoo’s foam, while rough on hair, isn’t just for show–it actually cleans. “We really don’t clean as much as a regular shampoo,” admitted Ralf Zissel, Deva’s head of R&D in reference to No-Poo. Daily shampooing might, however, be overkill: “But we also think it’s not necessary to clean it with these harsh ingredients,” Zissel added. That’s especially true for people with coarse, frizzy, or thick hair, who might want to retain natural oils to keep hair smooth. More people of all hair types are buying into that promise. No-Poo’s sales have nearly doubled in the last three years, says DevaCurl, with 2014 shaping up to be the best yet. In the meantime, the shelves have become more crowded with products moving away from our traditional sudsy conception of shampoo. “It’s a grassroots movement that is becoming one of those more sensationalized beauty media topics in the last year or so,” added Walsh. He and others I spoke with attribute the trend to ingredient awareness. Sulfate-free shampoos, for example, barely existed 10 years ago. Pureology basically created the category when it launched in the early aughts, positing it as a better alternative for dyed hair. L’Oreal acquired the brand in 2007, and now “sulfate-free” shampoos are available in CVS for $6.99. “It dovetails with the actual resale trend of going more natural,” Tim Barrett, an analyst at Euromonitor said. Boomers and young people alike have seen the results of chemical abuse and don’t want to go down that path. Consumers are gravitating toward products with organic ingredients instead. Some are even abandoning shampoo altogether. It’s hard to pin down when the no-poo movement started. No poo (not to be confused with No-Poo) means going completely shampoo-free, replacing traditional shampoos and conditioners with baking soda and cider vinegar. The most common recipe goes at least as far back as 10 years. A 2004 LiveJournal post serves as the FAQ on the no-poo subreddit, which has almost 7,000 subscribers. In the last three years, however, the trend has bubbled into the cultural consciousness. 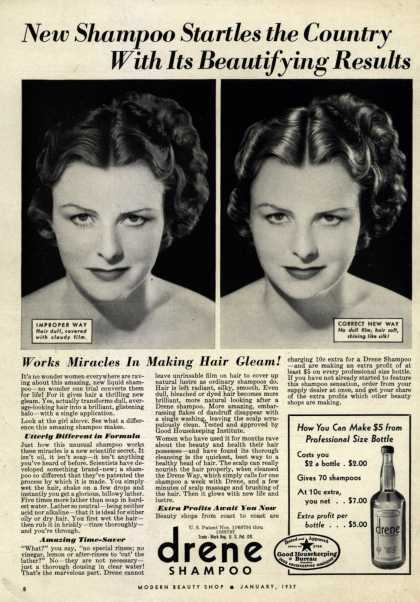 In 2011, The Hairpin posted an article titled “How to Quit Shampoo Without Becoming Disgusting” and this year posted a follow-up, “What I’ve Learned From Three Years Without Shampoo.” Those two articles have attracted 1 million unique visitors, making them some of the site’s most popular stories. Within the last few years, Elle, W, and Glamour have all published their own testimonials. After about three years without shampoo, my hair is noticeably softer and fluffier than it used to be. To get superhero locks, however, takes a potential deal-breaker of a commitment: It requires four to six weeks of calibration, which means not washing with anything–just water. For many, that goes too far. “There are a lot of women on the Internet (it seems) who are heroes who just sort of don’t worry about that, or say that you’re not as greasy as you think,” a friend of mine who tried to go sans poo this summer told me. “I, however, was greasier than a fried chicken.” She now uses “regular” shampoo a few times a week. For the record, a dermatologist I spoke with does not recommend baking soda for everyone, noting that it’s strong enough to remove tarnish and rust. “Why people think they need to use anything that caustic to clean their hair, it makes commercial shampoo look like child’s play,” Nicole Rogers, assistant clinical professor in the department of dermatology at Tulane University School of Medicine, said. No-pooers balance the very basic baking soda with the acidic apple cider vinegar, and slightly dilute both ingredients, but still. The rise of the non-shampoo shampoos cater to people like my friend, and frankly, me, who have an aversion to “chemicals” and will buck against socially acceptable hair care routines for perpetual good hair days, but are unwilling to give our heads to the grease gods for a month or two. I imagine that’s why Barrett, the analyst, said the no-poo movement hasn’t made a dent in shampoo sales, which were up 2.9% last year. But that the natural hair care category is growing. Purely Perfect and No-Poo have all the promise of no poo without the sacrifice. Hairstory says for some it might take several weeks to notice a difference. After only a week of using Purely Perfect my hair is softer than ever, although, not as curly as usual. While some people complain about the mint smell, I like it. The lack of lather doesn’t bother me either. Since curl composition is my MO, I probably won’t stick to Purely Perfect forever. But, Like, Does It Work? Little scientific evidence suggests that the chemicals in shampoo are flat-out bad for us or the environment. In addition, little scientific evidence suggests that the chemicals in shampoo are flat-out bad for us or the environment, which of course, is the underlying message in the pure Purely Perfect with its notable lack of certain chemicals. The American Academy of Dermatology admits that sulfates are indeed “harsh,” and caution people who have sensitive skin. The medical literature shows that traditional shampoos can cause irritant contact dermatitis for some people. Most people, however, will have no problems. The American Cancer Society has dismissed the idea that the sulfates and parabens contained in shampoo cause cancer. “Don’t forget all of these products are diluted,” Deva’s Zissel noted. Despite all the other claims, the war on shampoo is about aesthetics. “Working is more powerful than marketing,” said Walsh. People buy Deva because it has fewer chemicals, but they keep using it because it results in good hair days. Lucky for Gordon, in addition to a growing natural beauty market, grunge is back and greasy hair is in.